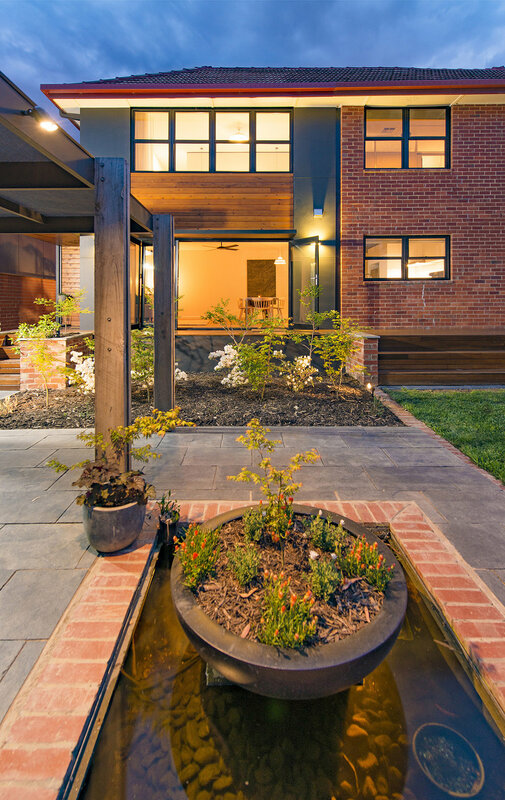 This 1950’s Canberra red brick duplex has gone through an extensive refurbishment and extension which allowed it to adapt to contemporary family living. A master plan included extensions to the duplex and a separate building that includes a stand-alone one bedroom flat and double garage. The original living room of the duplex was opened up to the north-east through large bi-fold doors, maximising natural light and connect the living room to a private courtyard. This courtyard acts as a privacy / acoustic threshold to the busy suburban street and provides additional living space for children to play and entertaining. The rear wall of the existing kitchen was opened to a new dining / living room with additional bi-fold doors connecting the space to the rear yard facing the quieter side street. Upstairs, a generous main bedroom and ensuite completes the home for the growing family. Materials and colours chosen for the new work were a contrast to the Canberra red brick so the transformation from old to new is distinguished.